Nordheimer Campground: Located in Klamath National Forest: Ranger District (530) 627-3291. 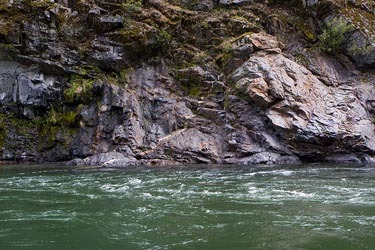 You’ll find this beautiful and secluded campground has the closest accommodations to the whitewater area of the Salmon River. There are 12 family sites with grills, water, and garbage pickup. Marble Mountain Ranch: Somes Bar, (800) KLAMATH (552-6284). This lodge offers a variety of accommodations including furnished deluxe homes, cottages, full RV hookups, and group campgrounds. The largest of which holds a group of eight people. The large campsites have a free central shower house and laundry facilities. In the peak season, typically spring and early summer, be sure to try the freshly prepared meals consisting of baked breads, deserts, salads, garden grown vegetables, and select meats cured over native hardwoods. Elk Creek Campground: Happy Camp, (530) 493-2208. Tent camping, full service RV hookup sites, and cabin rentals located in the northern part of the Klamath National Forest. Bring fresh water with you. Not all the campgrounds in the area have running water, so if you are planning to camp and don’t have a water filter, make sure to bring plenty of fresh drinking water with you. This secluded Ranch is located along the Klamath River. Cabins can accommodate up to four people and each has a covered outdoor deck and a fully equipped kitchen, bedroom, and bathroom. Forest Lodge Motel: Happy Camp, (530) 493-5296. Off of scenic Hwy 96, this Motel offers 15 guest rooms able to accommodate up to four people. Amenities include cable TV, microwave, small refrigerator, and Queen bed. Located close to nearby activities other than boating such as fishing, biking and hiking trails. Conveniently located in downtown Yreka, this Inn offers 150 guest rooms and 2-bedroom apartment suites with kitchenettes. Each room has Internet access, and cable TV. Guests also have access to an outdoor pool. Inn perk: Complimentary continental breakfast. Campton House Inn: Eureka, (707) 443-1601 or (800) 772-1622. This charming American Arts and Crafts style, family owned and operated Inn is in the heart of downtown Eureka. It offers 3 bedrooms, each with a Queen size bed, TV, and telephone. Stop by the historic Carson Mansion, located just next door, if you have the time to take in the history of this northern most town. Downtown is also full of antique shops and restaurants. Inn perk: afternoon tea and continental breakfast. The Inn offers 108 guests rooms or family suites and is centrally located in Eureka. The on-site restaurant also provides room service. Amenities include Internet, TV/HBO, coffee/tea maker, and telephone. Guests can also enjoy the heated year-round indoor/outdoor pool, hot tub, game room with pool table, and garden area. Inn perk: Complimentary continental breakfast. Abigail’s Elegant Victorian Mansion: Eureka, (707) 444-3144. The name of this National Historic Landmark speaks for itself. This bed and breakfast is well known for its “elegant” accommodations and beautiful gingerbread style exterior and period Victorian furnishings inside. Each room is newly restored and blends period antiques with modern conveniences. B&B perk: Bicycles supplied to guests, croquet, and a sauna.